It’s difficult to review this movie without giving away the plot details, so be warned that spoilers are to follow. Although it hardly matters because by the time the aforementioned twists occur, you won’t much care one way or another. 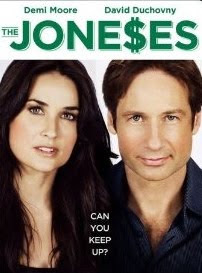 David Duchovny and Demi Moore star as the Joneses, a married couple living in an affluent suburban neighborhood. They are new to the community and along with their two children, they arrive with the latest gizmos and gadgets on the market. They flaunt their flashy cars, high-def cameras and jumbo television sets to everyone on the block, who become openly envious of their wares. The twist is that they are not a family at all. Rather, they are high priced sales associates posing as a happy clan. They are not just selling high priced electronics, but also the lifestyle that goes along with them. The idea is that the rich neighbor folk will be inclined to upgrade their cars, televisions and furniture to keep up with the Joneses. The concept has some merit, especially if it was played for laughs. There is a comedy in here somewhere that I think could have been very funny. Instead, everything is taken so seriously that it becomes hard to swallow. Duchovny and Moore are entertaining, as are their neighbors, played by Gary Cole and Glenne Headly. Unfortunately, much of the story line hangs on their children, barely acted by Ben Hollingsworth and Amber Heard. They are both very pretty and would likely fare well in Abercrombie and Fitch catalogues, but as actors they are drab and lifeless. I can’t help but think how great this film would have been were it made as a screwball comedy starring Steve Martin and Goldie Hawn. To watch the two of them hoodwink an entire town into buying crap they don’t need would have been a hoot. Instead we have this wishy-washy drama that is truly crap we don’t need.